But now that I spend days in Bermondsey slaving away in my artist's studio I'm forced to forage for food in the great unknown. It's either that or cup noodles everyday (going hungry is not an option). Happily, nearby Bermondsey Street is lined with cafés, restaurants, and bars, so everyday is a culinary adventure! 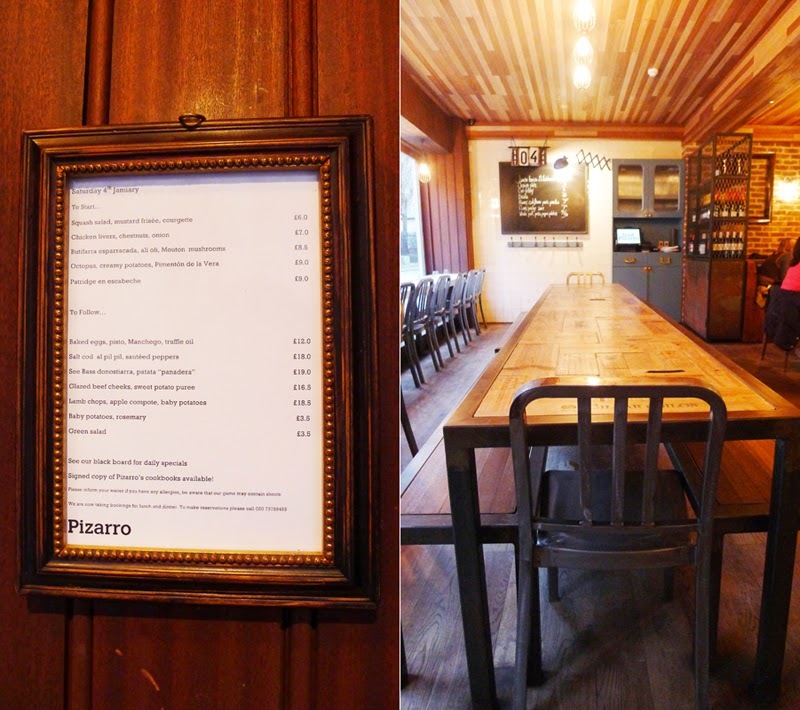 On Saturday, Diana and I lunched at Pizarro. Which is not at all related to Bizarro the comic strip. I don't know how I made that connection, but there it is. The daily menu changes everyday, as daily menus tend to do. This sentence was brought to you by Captain Obvious. 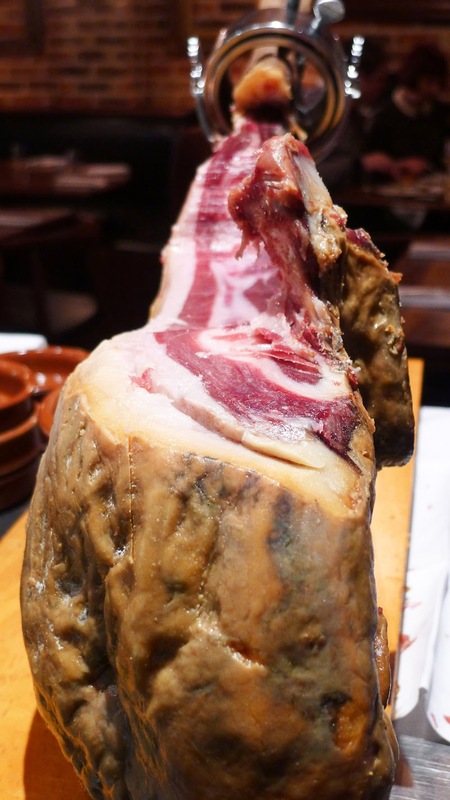 I am simultaneously repulsed and delighted by this photo...I've always wanted a leg of jamon hanging in my kitchen as the only rustic touch to my dream kitchen with white marble everything (countertops, floor, island with King Louis Ghost chairs) wouldn't that be such a jarring luxury? But the texture of the skin...reminds me of something I'd find in the medical exhibit of the Wellcome Collection. Diana's baked eggs with pisto, manchego, and truffle oil. Inspired by the delightful egginess of it all I've bought dozens of eggs, all I am cooking for dinner this week is shakshuka. Speaking of eggs I have an eggscellent story that of course takes place in my new favourite borough. Yesterday I was at The Garrison (also on Bermondsey Street, naturally), tipsy on a single bellini (I'm a cheap date, cheap but never easy) when a waiter walks towards me carrying crates of raw eggs. I squeal, my head turning to follow him as he walks past me with the eggs: "Eeeeeggs! Ahhhh! My favourite! I love eggs! Egggsssss!" The manager (I think) was so amused he gave me an egg, sitting in a silver egg cup, to play with. Diana got jealous so she got one as well. Jay refused to let me carry raw eggs in her new car so I had to give the eggs back. But I was so happy, drunk as a lord and cuddling my new pet egg! And being photobombed by the man who gave me the egg. I had three starters instead of the traditional route of starter, main, and pudding. Prawns on a bed of cauliflower puree topped with pancetta shavings. And finally, my octopus swimming in creamy potatoes and pimenton de la vera, topped with salad. The colours were most pleasing to the eye, the dish was beautifully presented (Diana begs to differ, she thinks it's disgusting "You're eating an animal's leg!" Oh, and chicken wings grow on trees do they? ), and beautifully cooked...not rubbery or chewy, just soft and tender. My three starters and orange juice came to less than £30...what sorcery is this?! Such good value. I am pleased. Bermondsey, I like you...I think you and I can become friends. Also on my Bermondsey Street to-do list is Antico, Zucca, Hide bar, Constancia Argentine Grill, Le Pont de La Tour, Spa Terminus, the antiques market, White Cube gallery...take a deep breath before you pass out, woman. I wonder how many of these I can write off as work expenses (my new favourite question to myself is 'Can I expense this?). Ah! I just want to explore Bermondsey and be a South London hipster! This is the week I finally explore and dare I say even enjoy South London. I'm trying to be less of a snotty, narrow-minded, insular postcode snob. Maybe I'll even venture out to Peckham! Haha, no I'm just joking, I'm not that adventurous. 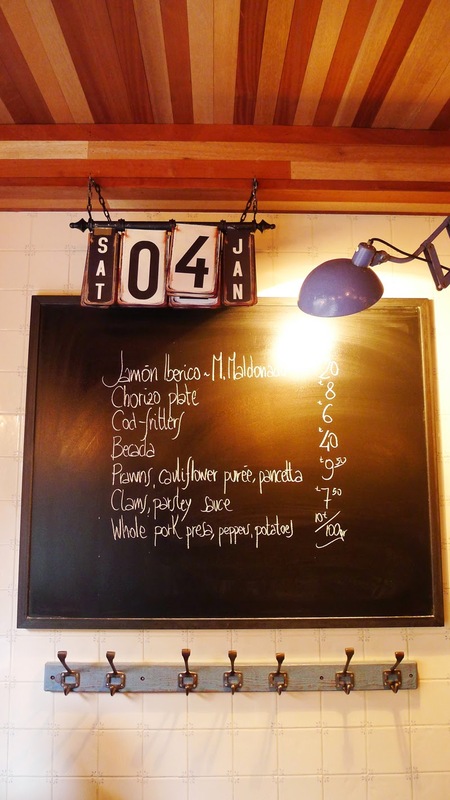 Two more for your Bermondsey St list: Jose (tapas bar) and Casse Croute (casual old school French). They're opposite each other and both had great reviews. Nothing wrong with South London - born and bred Bromley girl! Octopus is one of my favourites but I do get how it freaks some people out. I always serve it on my antipasta platters as a kind of guest bravery test. Pass it, and I will feed you again. Fail and you are dead to me.